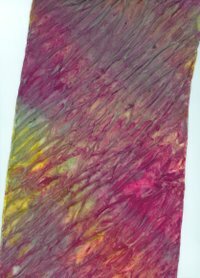 S Wikipedia describes Shibori as, "a Japanese term for several methods of dyeing cloth with a pattern by binding, stitching, folding, twisting, or compressing it. 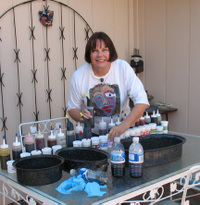 Some of these methods are known in the West as tie-dye." "In Japan, the earliest known example of cloth dyed with a shibori technique dates to the eighth century. It is among the goods donated by the Emperor Shomu to the Todai-ji in Nara. Until the twentieth century not many fabrics and dyes were in widespread use in Japan. The main fabrics were silk and hemp, and later cotton. The main dye was indigo and, to a lesser extent, madder and purple root. Shibori and textile arts, such as tsutsugaki, were applied to all these fabrics and dyes", continues Wikipedia. Here the Arashi Shibori technique is used. Using a 4 inch PVC pipe and thread. Gaywool dyes were applied with a pipette. I call this design the scrunching together method. 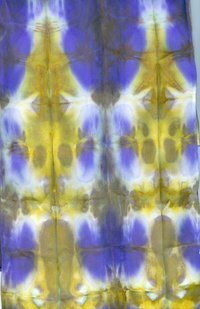 Gaywool dyes are my favorite dyes to use for Silk Shibori. You just mix them with boiling water. We set the dye by steaming them in a steaming pot. I did add vinegar to the boiling water at that time. When dying silk you do not need to wet the fabric before you add the dye. Here is the Shibori folding method which is done using clothes pins, clamps, rubber bands and anything you may think of to add more design to your folded Shibori. Two days of workshops -- fun in deed. Once you set up for such a project, it is easier to take advantage of the time and dye to your hearts content. You can read step by step intructions in the book written by Elfriede Moeller, "Shibori The Art of Fabric Tying, Folding, Pleating and Dyeing."